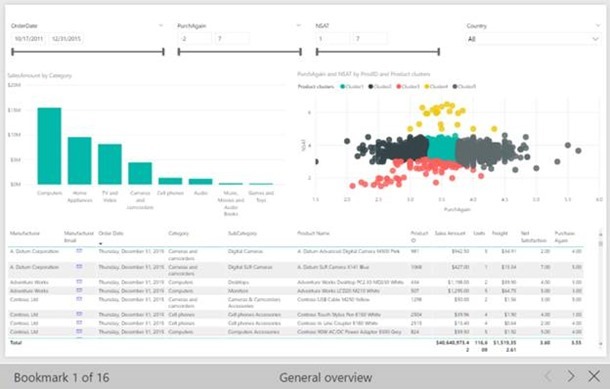 This month we are very excited to share one of our most anticipated features from the Microsoft Data Insights Summit: Bookmarking. Combining bookmarking with some of our other recently released features such as drillthrough and what if gives you powerful storytelling capabilities and lets you create highly interactive reports. We also have some more visual improvements and a big update to our quick measures feature this month. We are very excited to announce our preview of bookmarking. This was one of the features we demoed at the Data Insights Summit as a very powerful way to save and share out your insights with others. Bookmarking lets you save interesting states as part of your report. Once you have a list of bookmarks, you can use those in several ways, including a quick way to pick up where you left off in your analysis, for organizing presentations of your report, creating report navigation, and more. And while we don’t yet bookmark cross highlighting, that is something we definitely plan to implement soon. Once you turn on the preview feature switch, you can add bookmarks by opening the bookmarks pane, which can be found under the View tab. Set up your report to look how you want, with all the filters properly set, and click the Add button under Bookmarks. This will add a bookmark to pane, which you can rename and go back to whenever you want. You can continue adding as many bookmarks as you want. If you want to use your bookmarks as a story or in a presentation, you can use the View option to enter into a view mode for bookmarks. When in this mode, there is a title bar for each bookmark that includes the bookmark name and navigation arrows. At this point, you can close the bookmarking pane if you want. 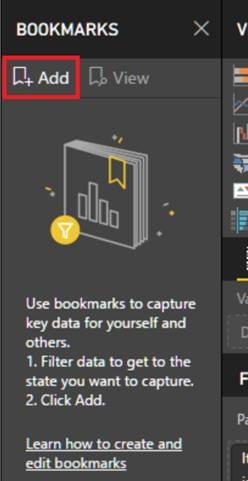 This mode is a good way to preview your bookmarks in the Power BI Desktop. It’s also a great way to navigate bookmarks in the Power BI service, where you can also enter into full screen mode to hide all the navigation menus. While bookmarking is in preview, you will need to add your initial bookmarks to your report in the Power BI Desktop. After you publish your reports to the service, you’ll see the bookmarks pane option in the View dropdown and can then edit and view your bookmarks all you want. Since this feature is in preview, you’ll need to enable it the first time through File>Options and Settings>Options. 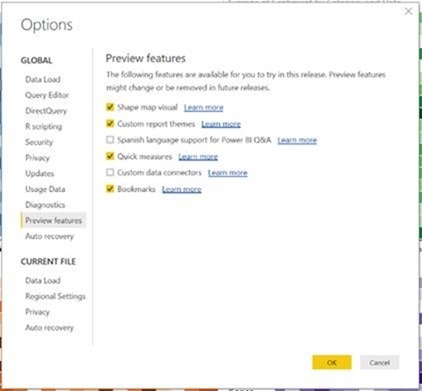 In the dialog, open the Preview features tab and select Bookmarking. While bookmarking is in preview, we would really appreciate your feedback. What would you like to see added or changed? So please, start playing with the preview and add any and all feedback you have to the comments here and our ideas page! As part of bookmarking, we also added a new selection pane. 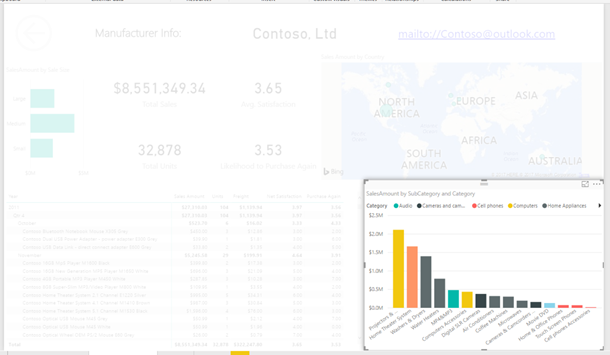 This pane lists out all objects on the report page you are currently viewing and allows you to select the visual from here. This is very useful when you are authoring complex reports with many overlapping charts. You can also hide visuals on your report through this pane. By combining this feature with bookmarking, you can create very interesting reports with visuals changing out depending on the current bookmark selection. You can open the selection pane through the View tab. In the selection pane, for each item on the current page, you’ll see either an eye or line icon letting you know if it is visible or not. Clicking on the eye icon will let you toggle the visual between hidden and visible. As mentioned earlier, visibility state can also be bookmarked, so it is useful for storytelling purposes. 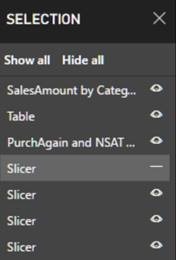 While hidden, slicers will continue to filter the report page, so you can create some pretty interesting reports using this feature. Another feature we are releasing in coordination with bookmarking is links for shapes and images. Last month, as part of drillthrough, we added the ability to link shapes and images to the previous page to create back buttons. We are extended that linking feature to also allow you to link shapes and images to bookmarks as well. 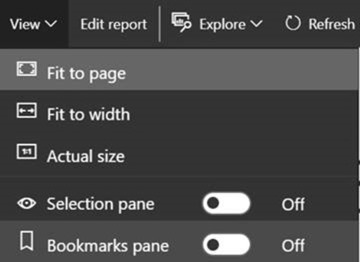 This is a great feature for creating custom navigation in your reports or creating buttons that perform different actions across your report. You’ll find the option in the formatting pane under the Link card. You can pick either Back or Bookmark as your link type. If you pick bookmark, you’ll have a dropdown to pick one of the bookmarks you currently have in your report. Just like the back button, you can activate bookmark buttons by pressing ctrl+click while in editing mode or just clicking in reading mode. As part of bookmarking, we are also adding a new way to call attention to a specific chart during presentations. You can already use our focus mode to temporarily increase the size of a chart to fill the whole page. If instead, you want to easily call attention to a chart without losing the context of the report, you can spotlight a visual to fade out all the other charts on the page. Clicking anywhere else on the report will remove the spotlight. You can find this option under the “…” of any chart. This spotlight feature can also be included as part of a bookmark. Back in June, we released marker controls for line, area, and combo charts, and this month we are extending marker controls to scatter and bubble charts as well. Using the Marker shape option in the Shapes card of the formatting pane, you can change your marker to a circle, square, diamond, or triangle. 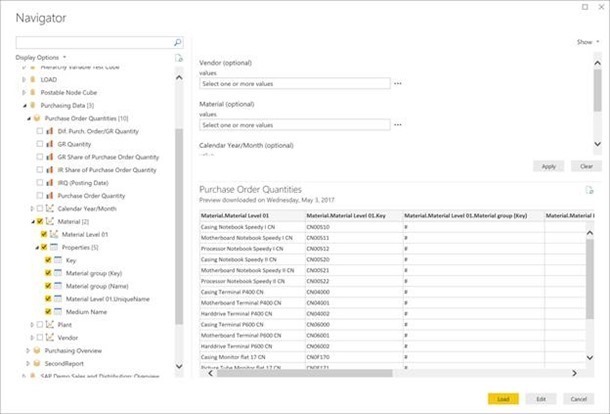 You can also customize it per series to make your reports more accessible. Last month, we introduced a new sampling algorithm for scatter charts designed with high density data in mind. We didn’t want to stop there, so this month we are also giving you a way to increase the number of data points shown in your scatter chart. Using the new Data volume slider in the General card of the formatting pane, you can set the max data volume to any number between 3,500 and 10,000. Since more data points can mean longer loading time, if you do choose to publish reports with limits at the higher end of the scale, make sure to test out your reports across the web and mobile as well make sure performance matches your users’ expectations. Now you can use quick measures for report that are using live connection mode against SQL Server Analysis Services models. You can turn on the preview feature switch and start using them right away in your models. One thing to be aware of is since different quick measures require support for different DAX functions and operators, some quick measures won’t be available on certain AS server versions. 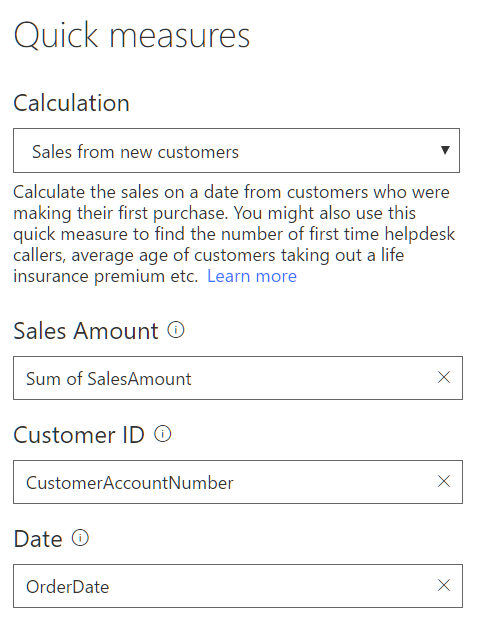 We also are extending quick measure support to work with your custom date tables. 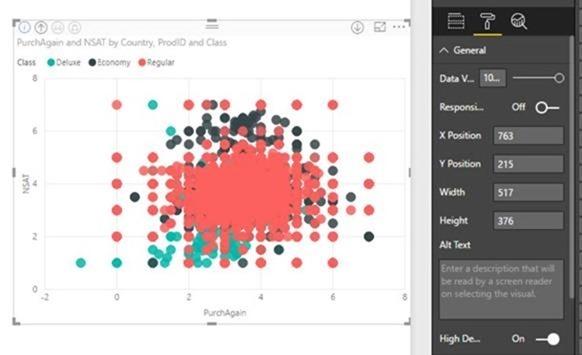 Previously, the time intelligent quick measures (period-to-date, period-over-period, rolling average) could only be used with the Power BI-provided hierarchies. Now, if your model has a custom Date table (for example, the DimDate table in the AdventureWorks model), you can use the primary date column in that table for time intelligent quick measures. You’ll need to make sure the person who build the model has marked it as a Date table. We also have yet another quick measure to share with you: totals from new categories! You’ll find this new quick measure under the Filters category. 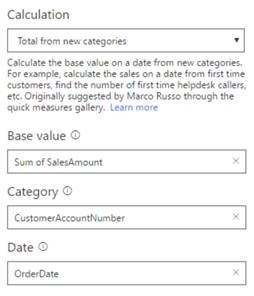 This quick measure lets you find things like the sales data for first time customers or the number of first time helpdesk callers. Thanks to Marco Russo for submitting this in the Quick Measures Gallery. Be sure to try this new quick measure out and let us know what measures you’d like added next! 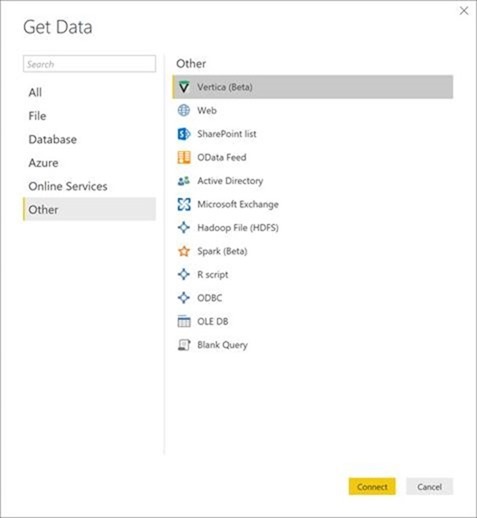 With this month’s update, we’re adding a new data connector to Power BI Desktop for Vertica. The Vertica Analytics platform is designed for use in data warehouses and other big data workloads where speed, scalability, simplicity, and openness are crucial to the success of analytics. Vertica relies on a tested, reliable distributed architecture and columnar compression to deliver blazingly fast speed. The new Vertica connector allows you to build reports by importing or creating a DirectQuery connection to your databases in the Vertica Analytics Platform. The new Vertica connector is available as a beta connector and can be found under the “Other” category within the Get Data dialog. When selecting this connector, you will be prompted to specify your Vertica server/database details and will be able to specify which Data Connectivity mode to use. The first time you connect, you will be asked to specify credentials for Vertica. Once the connection has been established with your credentials, you’ll be able to browse and select one or multiple tables within the Navigator dialog and then decide to load or edit your data. One of the most requested features for the SAP BW connector has been the ability to import additional member properties, besides Medium Name. 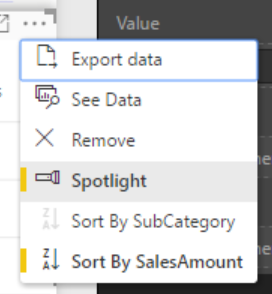 With this month’s release of Power BI Desktop, we’re making these properties available in the SAP BW connector so that you can select them within the Navigator dialog. 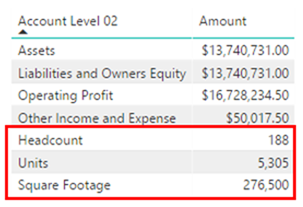 You can select one or multiple properties for each selected object, which will be represented as new columns in the output results of your queries. You can learn more about this feature and our other announcements at Ignite in our dedicated blog post. 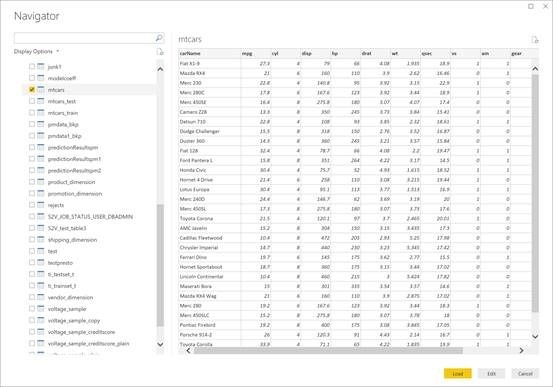 We want to make it even easier for new users to find content that will help the learn Power BI and current users get access to community sites, so this month we are adding a Help tab. This tab is all about giving you quick and easy access to all these resources. We also know how important it is when a user is new to get access to these resources, so we have integrated our newsletter form into the first experience. 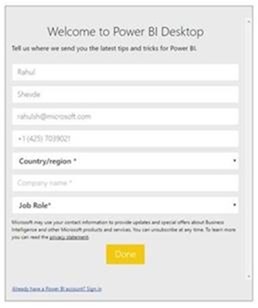 Starting this month, new users will see a form to fill out before they can start using Power BI Desktop the first time. Once this form is filled out, we can provide helpful newsletters with getting started content and latest announcements.